Soak in the inviting atmosphere in this two-bedroom, two-bathroom condo. The open concept is perfect for gathering the family together after activities. 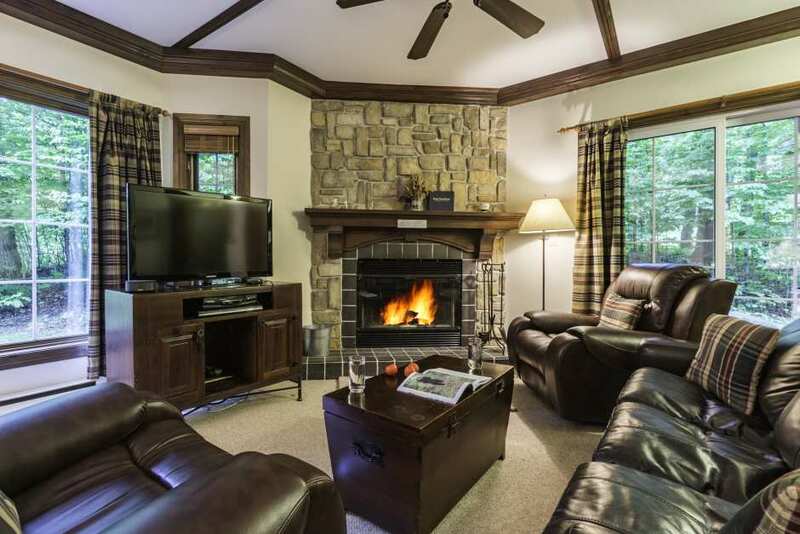 In winter, you’ll love the grand fireplace and heated tiles. In summer, guests can relax on the patio with a natural view and enjoy a barbecue. The well-appointed kitchen makes cooking a breeze. The dining room features a good-sized table and a large window that lets in the light. You’ll enjoy lingering on the comfy leather sofas in the living room to talk about the day’s adventures. The master bedroom includes a bathroom with whirlpool bath and is furnished with a queen-size bed, dressers and a TV. The second bedroom has two comfy twin beds, dressers and a TV. Other conveniences offered to guests include wireless high-speed internet access, a large TV with DVD player and a compact sound system. This 1100 sq. ft. space is sure to delight you during an enjoyable stay.